After doing two scramble challenges in a row, I’m ready to change things up a bit. Moon version seemed like the best candidate for a couple of reasons. One, I got a New 3DS and wanted to see how it ran in comparison to the older model. Two, I wanted to get rid of my shiny charm as I’m one of those people that think it reduces the value of shiny Pokémon. They are unconventional reasons to say the least, but I hope they make sense to some degree. Choosing which type to do was tricky. There were several types I was interested in and all of them looked like fun. To make it easier, I entered them all into a chooser website and let it pick for me. Of the types entered, flying was chosen. This works as I can use Rowlet temporarily and then switch to Pikipek once I can store it in the PC. 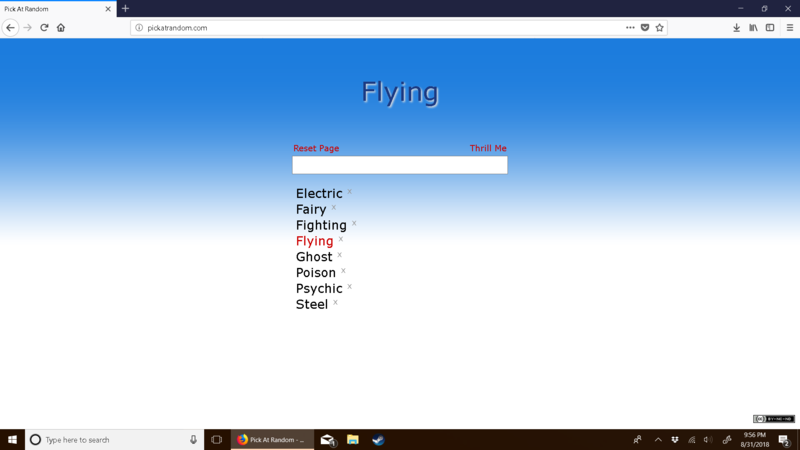 There are lots of great flying types to use throughout the game as well. I’ve planned my team in advance, but I’ll hold back on sharing it until everyone is caught. My first experience with Moon Version was the day it came out. I eagerly awaited it’s release and binged through it the following weekend. Unlike X and Y, I look back on this game fondly. The journey was actually challenging and it helped me through a rough patch in my life. Ultra Moon was fun as well, but I can’t help but feel like it was a bit cluttered in the execution department. Still a great update to the original though. First things first. Delete my save file and start a new one. My Pokémon are all stored on Pokémon Bank, so there is nothing to worry about. Next is my name. Once again, I settle on Benjamin. Naming a blank slate character after yourself can be a great way to immerse into the game’s world. As for his appearance, I went with the blue haired version. 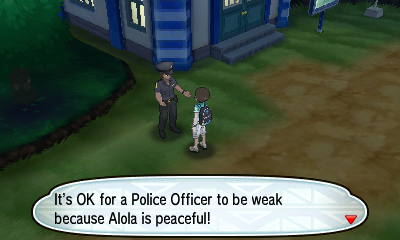 I’ll change his clothes and hair once I reach Hau’oli City. After Kukui’s opening monologue finished, the first of many cutscenes played. In the distance was Lillie and a precious little bean named Nebby. They were running from a group of Aether Foundation members until they got surrounded. Nebby used teleport and fled the scene. It’s a nice cutscene, but there will be many more. I’ll refrain from describing them here on out because we’d be here all day. A nice view of Mele Mele Island at night came into view and I finally got control of my trainer. 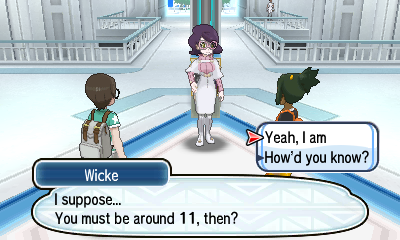 Despite this being my second playthrough, this is the first time I learnt thatthe protagonist’s Mom was inspired to move to Alola after she saw Kukui participate in the Pokémon League. Indicating he went to Kanto after finishing his island trials. I wonder if he went to any other regions. Next you’ll tell me there are telephones that you can fit in your pocket. I saved Nebby from the flock of Spearow and got to see Tapu Koko in action. This was another reminder that every time I see Nebby I want to give him a hug. A few minutes later I got a Rowlet. 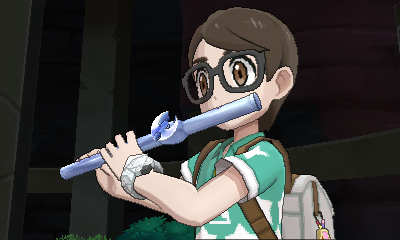 Watching my character hold it up made me feel guilty for not wanting to use it, but I’m not going to use a Dartrix for the rest of the playthrough. I named Rowlet Boxbirb to fit his purpose. For the eleventy seventh time, I watched the Pokémon catching tutorial. I wish they had a skip option for us long time players. These tutorials are useful when you are new to the series, but when you’ve been playing for eight years straight they start to get frustrating. After 42 minutes (no joke), I finally had the opportunity to catch a Pikipeck. I named him Toco after the species of toucan Toucannon resembles the most. The name has a nice Hawaiian feel to it. Note to self: Pikipeks are frail. Toco can’t take hits to save his life. Hopefully this will get better as he evolves into a Toucannon. To prevent Pichu from overpowering Toco, I let Boxbirb handle the rodent with leafage. Same with Popplio. Boxbirb had the type advantage over the opponent and Toco was still too frail to risk getting attacked. 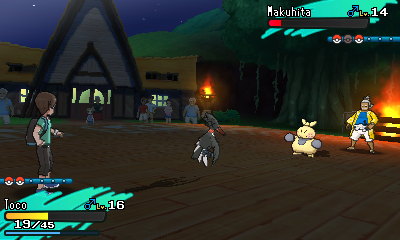 Overall, the second Hau fight was tougher than the first, but not by much. 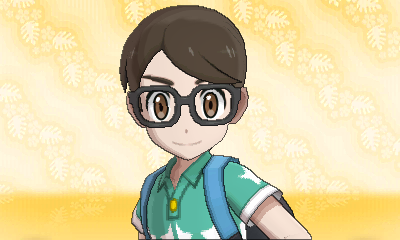 Next time, I am heading to Kukui's Lab, the Pokemon Trainer's School, Hau'oli City, and Route 2. Hope to see you there! "You represent the Ground type! The Ground type is all about balance. Like the very Earth you stand on, you are careful and deliberate about your actions. Your patience is a virtue, and you rarely lose your balance when navigating tricky waters. However, you remain an enigma, Ground type. Be sure to communicate your wisdom to others, and perhaps they can assist you in turn. You are somewhat isolated due to your introspective nature. You have a strong sense of self, and are rather stubborn when forced to deviate from the course you know to be correct. Again, remember others' perspectives, Ground type. There is more to the Earth than the ground we walk on, after all." Flying-type can be a fun one to do. You have plenty of Pokemon ahead, and some of them will be able to hit for some big damage! Good thing you'll be able to get Brick Break for Totem Raticate as that approaches. 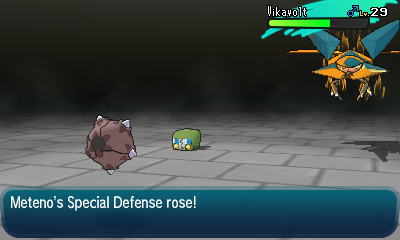 The Teacher with the Magnemite could potentially do some damage, though. Nice to have screenshots, too! When I write these updates, I jot what happens on my phone's notes app while taking screenshots. Later on, I revise and edit the notes before copying them onto this site's editor. Then, I add in the best of the screenshots I've taken through Imgur. For some reason, the notes I took vanished and I only have the screenshots to prove it ever happened. I'll try to summarize what happened the best I can and find a better way to take notes. Apologies if this affects the writing. The first thing I did after beating Hau was head to Kukui's Lab and catch a Metapod. There was a teacher in the Trainer's School who packed a Magnemite, and I thought raising it to become a Butterfree would be a good counter for it. The Metapod was named "Papillon," the French name for Butterfree. 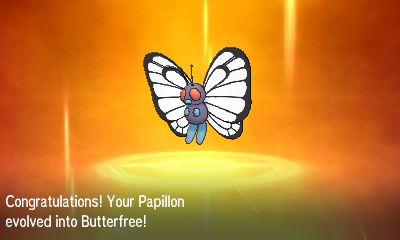 Evolving Papillon into Butterfree was like raising a Magikarp to a Gyrados. His only move for the longest time was harden, which made switch training a requirement. My effort was well worth it as I couldn't beat the Teacher without him. The strategy was simple. Put Magnemite to sleep with Papillon and finish it off with Toco's rock smash. It took a couple of tries because of Magnemite waking up too soon, but I eventually took the flying magnet out. Meowth was no problem aside from it trying to make Toco flinch. 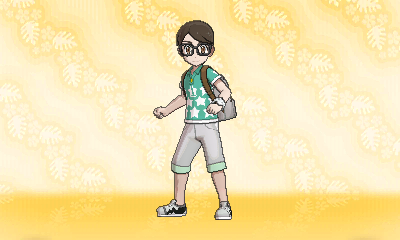 As soon as I reached Hau'oli City, I wanted to change my avatar's appearance to match my own. Unfortunatly, I had to go through a bunch of tutorials and story segments I've already seen before I could do so. Reaching the Apparel Shop was a disappointment. The only pants were capris, and there were no glasses in sight. 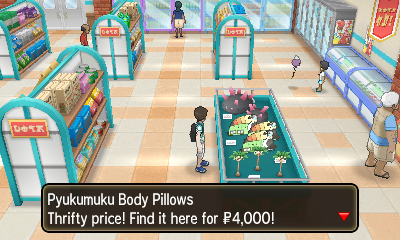 Hopefully Akala Island has a better selection. At least the salon got my hair and eyes right. 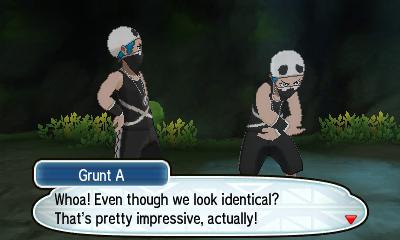 Nothing of note happened with the Team Skull Grunts or Captain Lima's battle. All I can say is I love Team Skull. Their eccentricity makes them endlessly entertaining. I hope the next team can be just as memorable. Up on Route 2, I went to a place I'm sure many of us skipped on our original runs, Hau'oli Cemetery. 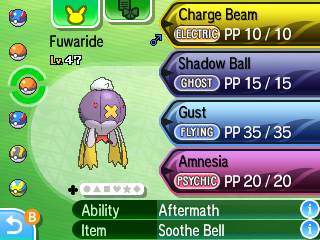 There I caught a Drifloon named Fuwaride. The nickname is Drifblim's Japanese name unaltered. After getting this long term party member, I deposited Boxbirb and Papillon into the PC. I already have my final team planned out and neither of them have a place on it. They were still pivital assets to the team. May you two spend your days in cyberspace together. 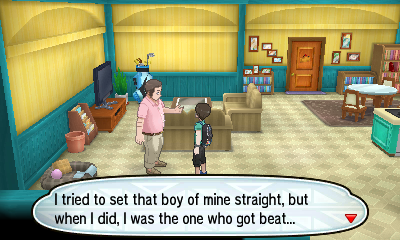 In Guzma’s house, his dad said, “I tried to set that boy of mine straight, but when I did, I was the one who got beat.” Implying his Dad harmed him as a child. Could this be what motivated him to be the way he is? There was also a cute little motel on the side of Route 2. Exploring it only yielded me two nest balls, but it was nice seeing the little details they put into the lobby. Unpopular opinion time: I think Delibird is a weak, but well designed Pokémon. The idea of a Santa bird Pokémon is oddly appealing to me. If only it was a little stronger. The open nature of Verdant Cavern reminds me of those Easter Island caverns that were used to grow plants. I wonder if that was a part of this location’s inspiration. I adore the trial music. It’s so upbeat and happy. 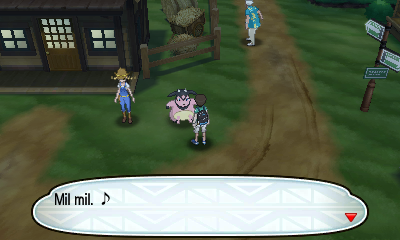 What’s even better is that it shares a part of its melody with the Kahuna battle music. I hope more songs in the series do this as it gives the soundtrack a sense of cohesion. Finding the TM for brick break was perfect. 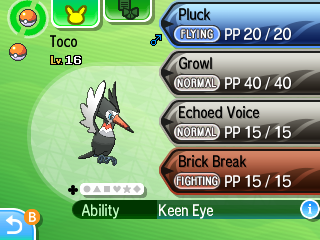 It gives Toco a better fighting type attack, and it takes advantage of the totem’s 4x weakness. The first totem battle was probably the easiest I have ever done. Two super effective brick breaks and Raticate was gone. No additional strategy needed. Hopefully the later ones will put up more of a fight. After fighting a few wild Pokémon on the way out, Toco evolved into a Trumbeak! 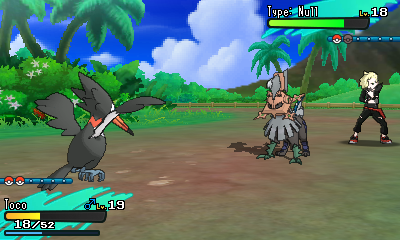 I’m not a big fan of this stage in Pikipeck’s evolution line, but Toucannon will make up for it. Next time, we’ll be traveling through Route 3, find Nebby in a patch of flowers, and fight Hala. Out of all the routes in this game, the northern half of Route 3 is probably my least favorite. It’s bare, empty, and has little to do. The canyon aesthetic also feels out of place in a tropical region. Right after I found Nebby, Hau challenged me for another fight. The problem? I had no counter for Pikachu. Struggling to work around this, I had Toco use brick break and hoped for the best. Shockingly enough, it reduced him to less than 50% HP. I tried it again, knowing it would take him out. For Popplio, I swapped out to Fuwaride as Toco was low on health. I used gust twice. 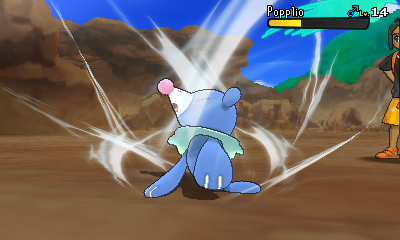 It was a STAB move and I wanted to go through Popplio quickly. With just a little health left on Fuwaride's part, I defeated Hau for the second time. During my travels to Iki Town, I fought the “boss” trainer and got myself a red card. It’s a one use item, so I’ll wait for a good opportunity to use it. Before I go on to the fight with Hala, let me share a brief story to share about the Kahuna battle music. When Sun and Moon were released, I had little to keep me going. All I did was play video games while I was kept out of school. Once I reached Hala during my first playthrough however, I got to hear this beautiful theme. The tone change, catchy melody, and memorability made me love it from the first listen. Not long after, I bought this song off of ITunes and played it all the time. Whether I was exercising, hanging around the house, or sitting in the car, I would listen to it. After a while, I dubbed it my “getting out of depression” music. As cheesy as it sounds, the song really did live up to it’s nickname. It was there the entire time I was getting out my depression. Hearing it again reminds me of those days when I was struggling to get out of bed. With that out of the way, let’s continue. I did not expect Hala to be particularly hard as my team counters his. To my dismay, he put up a really good fight. For Mankey, I sent out Fuwaride and had him use minimize. I wanted him to stay in the fight for a long time, and this would reduce the chances of the purple ghost getting hit. Hala’s Mankey ended up outsmarting me and used pursuit. Not wanting to be 2 hit KO’d, I swapped to Toco and tried to heal up Fuwaride. During this period, Mankey used focus energy and took Toco out with two karate chops. Thankfully, Fuwaride went first and finished Mankey off with gust. I began to worry as I was stuck on my last Pokémon. One strong hit and I was done for. My suspicions were correct. One pursuit and Fuwaride was out. I plan on training up and retmatching the Kahuna during the next update. Hope to see you then! I spent some time off screen to train my team up. Toco reached level 16 and got pluck, while Fuwaride became level 17. Feeling like this was enough to fight Hala, I returned to Iki Town for a rematch. What caught me off last time was that Hala’s Pokémon were all packing pursuit. Fuwaride was vulnerable to the attack, and I didn’t work around it very well. This time, I started with Toco to make sure Fuwaride didn’t get hurt. Pluck seemed like the best move as it was STAB and Mankey was weak to it. One hit and he was gone. While pluck did quite a bit to Makuhita as well, Toco was starting to look a little worn out. To alleviate this, I swapped to Fuwaride and healed the toucan up for the final Pokémon. Unexpectedly, Hala changed Makuhita to Crabrawler. I tried to get as many gusts in as I could before the crab could finish Fuwaride off. 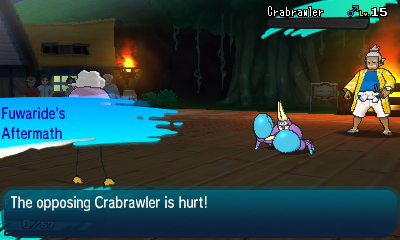 Just as he was going for the final hit, Fuwaride’s aftermath came in and took Crabrawler down with him. Finishing off Makuhita was as simple as a single pluck attack. After beating Hala, I revived the Ride Pager. Out of all the additions to Gen 7, ride Pokémon are my favorite. It’s such a fun, convenient way to traverse the over-world. Hopefully Gamefreak will add something similar to Gen 8. I ended up giving the FightiumZ to Toco. It should make his brick breaks even stronger. As for Fuwaride, I gave him an expert belt I found in a cave. One cute cutscene later, I reached shore on Akala. Olivia and best girl, I mean Mallow, greet everyone. This greeting was a great way to characterize the second Kahuna and Trial Captain. I wouldn’t change it in any way. Finally got my avatar to look somewhat accurate. The glasses, hair, and shirt are all one on one. As soon as I saw Sina’s first Pokémon, a realization was made. 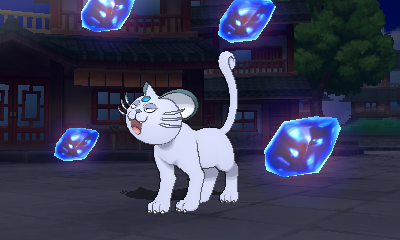 She is an ice type user. If I wanted to beat her, I had to think strategically. First was her Delibird. 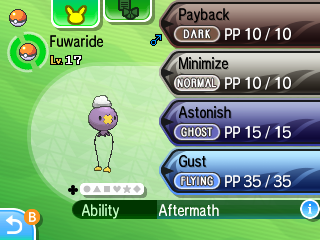 I switched out to Fuwaride and was able to protect him from present thanks to his ghost typing. Thanks to Sina’s good A.I. she was able to switch to Glaceon and sweep my entire team. Good thing the game carries on regardless of whether I won the fight or not. For the next chapter, I’ll be doing Lana’s trial and catch my next two team members. Time for a quick summary of the team! Fuwaride is at level 18 and packs an expert belt. Despite his low defenses, he has come in a lot of handy. 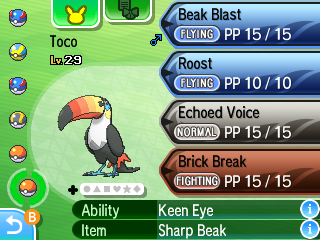 Toco is also at level 18 and has a sharp beak. His plucks do a ton of damage. Route 4 is the definition of alright to me. It’s a simple curved path going through a tropical forest. Aside from Eevee and the pretty visuals, there’s nothing of note here (Thankfully, they added in Pikachu Valley to spice things up). The trainer battle music on the other hand is a different story. Even after hearing it hundreds of times, I’m still not tired of it. The upbeat melody and well timed percussion really sell the piece. Minimize is broken. I forgot to switch in to Toco before the Hau fight and I used the move as a last ditch effort. Fuwaride was then able to weaken Pikachu without getting knocked out. I didn’t feel like healing my purple ghost so I let him use his aftermath before I swapped to Toco. Brionne was a bit concerning because he packed a Z move. Thankfully it wasn’t stab. If it was, I would’ve lost the battle. I love Panolia Town. It’s stands out so much from the other cities in the game. The western song that accompanies it seals the deal. My only issue is that it only has one accessible house. I dodged an old woman on the way to Panolia Ranch. She uses a Carbink, which I had no counter for. After a quick run in with best girl, I obtained Stoutland Search. Item finders like this are usually a bit tedious, but I might use this off-screen for some items. Let us take a moment to appreciate this wonderful Miltank who will heal up anyone’s team for free. The lag for double battles is actually minimal on my New 3DS XL. Makes me think Sun and Moon were designed with these newer models of the 3DS in mind. As brooding as Gladion is, I can't help but enjoy his character. Seeing him grow from a rude Team Skull member to an ally is incredibly satisfying. Now if only his first battle wasn't such a difficulty spike. Type:Null is ridiculously strong in comparison to the Pokemon you can obtain up to that point. Base 95 in everything except speed is scary to say the least. My first loss was quite similar to Hala's. Send out Fuwaride first to get some exp, and then get shut down by powerful dark type moves. Toco wasn't able to help either as he's too frail to work by himself. 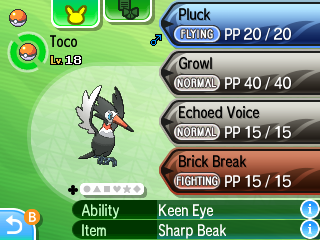 For my second attempt, I had Toco sweep through Zubat with a sharp beak boosted pluck. Type:Null, just like last time, was tricky. I could continue using pluck, or I could rely on brick break to do some super effective damage. I went with the former. Due to stat differences and a lack of exploiting it's weakness, Type:Null was able to soak up the hit. Toco was a bit low on health, so I healed him up with a super potion. As cheap as this strategy is, I attacked, healed up, and repeated. I wanted to keep Toco alive, and that was my only method. Originally I was planning on doing Lana's trial before uploading this, but I figured it's been long enough. Hopefully Wishiwashi won't be the nightmare that it was the first time around. I picked up the TM for charge beam and gave it to Fuwaride for coverage. Once I get thunderbolt, I'll have it be Fuwaride's electric move. Other than level, Toco is the same. Out of all the water types in the Alola region, Wishiwashi is my favorite. The concept of the solo and school form is really interesting and I had a blast using one on my original Moon team. Low HP and Speed aside, this thing is a beast. Fuwaride was out first. 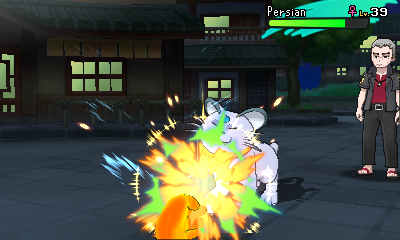 I was curious about how much damage charge beam could do and it was my only counter to this totem Pokémon. Surprisingly enough, it removed a third of Wishiwashi’s health. With Fuwaride’s special Attack stat up by one stage, I tried again. 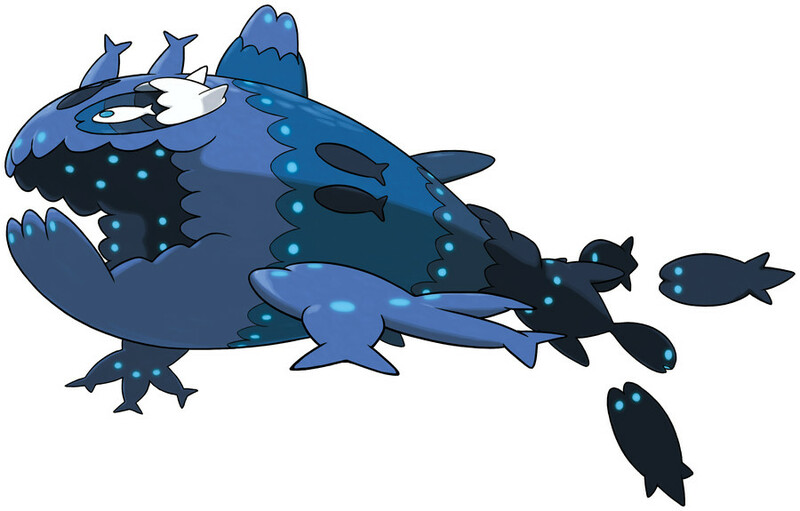 For some reason, Wishiwashi used soak to make Fuwaride a water type. This removed his deadly weakness to feint attack and let him soak up every water gun that came his way. Not wanting to lose my precious ghost balloon, I used a super potion on him. 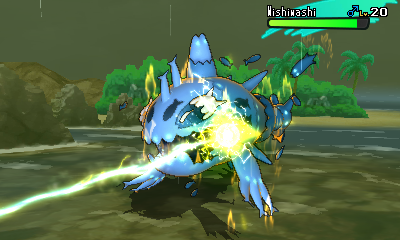 Once Totem Wishiwashi reverted to it’s solo form, there was no problem finishing it off. Up to this point, I have been worried about Olivia. Her team completely counters mine in both Pokemon selection and movepools. In order to remedy this, I caught a Magikarp and named her Rodan. The name comes from the Daikaiju monster of the same name. Once I beat Olivia, I will put Rodan in the PC for the permanent team members I have in mind. Time for another Pokémon! This one is an Oricorio named Akala. Her name comes from both the island she originates from and the Hawaiian word for pink. She will be a permanent member of the team. I used a Pom-Pom style Oricorio during my first playthrough of Moon and it was great. Being able to use one of a different form should prove to be an interesting. The Royal Avenue theme is like heaven to my ears. It’s so pleasant and relaxing. If only it was a little longer. Nothing of note happened during the battle royal other than the fact it lagged. Not as much as it did on my old 3DS, but enough to where it was noticeable. Went shopping in Wal- I mean Thrifty Megamart. Thanks to my discount coupon, I got half off on some timer balls! Over in Wela Volcano Park, I caught the fourth long-term party member! This one’s a Fletchling named Goshawk. Goshawks are birds that the Talonflame line resembles. I haven’t actually used one since X and Y released so I hope Goshawk is just as good. With five members to train up, including a Magikarp, it may take me a little bit longer to release the next update. This is unrelated, but I just remembered something. One of my mothers used to work at Pearl Harbor and she’d often visit Honolulu. 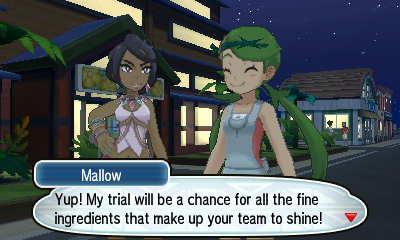 When I showed her Hau’oli City a couple of years ago she said, “yep. That’s Honolulu all right.” Despite knowing little about Pokémon, she still liked how Gamefreak adapted Hawaii. Back to the trial. Alolan Marowak went down without a hitch and the trainer wasn’t much better. Expected for a Gyrados. 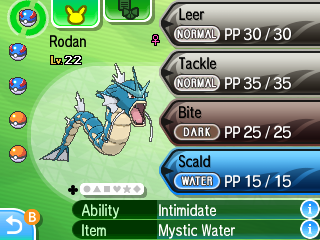 With Salazzle, I tried to start off with a super effective scald. It did a fair amount of damage. As expected, Salazzle used toxic. Despite being concerned about Rodan’s longevity, I kept her out. After a Venoshock from an ally Salandit, I gave in and swapped to Akala. I wasn’t going to let my counter for Salazzle go to waste. During Akala’s time out, I healed up Rodan and cured her poison. Even though Akala fainted before I went back to Rodan, she served her job well. With one final scald, Totem Salazzle and her Saladit ally were finished. Now that I have Charizard glide, I can have my team be trained up when I’m not playing. To keep this run a challenge, I’ll try only use it when I’m really far behind in levels. I love Route 8. It reminds me of those pretty highways that you can find by the coast. Turns out Gladion’s been staying at this motel the entire time. He payed for a two year stay to ensure he had somewhere to sleep. 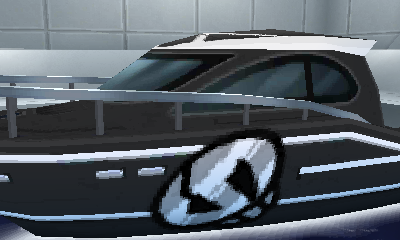 Despite playing through this game twice before, I never noticed this detail. After much anticipation, it is time for the trial of best girl. Out of all the trials in the game, I believed this would be the easiest. Even easier than Totem Raticate. As you will soon find out, that was not the case. First, I chose the wrong mushroom and got stuck in an encounter with a Shiinotic. Then, I picked up the wrong weed and found a Fomantis. Last, but not least, was Totem Lurantis. I started the fight by sending out Rodan. 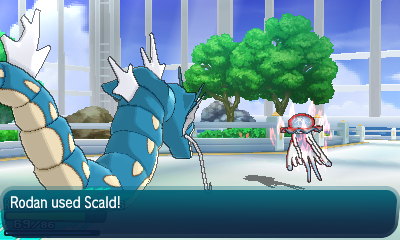 Her intimidate lowered Lurantis’ high attack stat and gave me the opportunity to use scald. Even if it’s not effective, the chance of a burn was too useful to pass up. To my dismay, it did not work. Solar blade and and pluck from the ally Trumbeak were too much for Rodan. I opted out and swapped to Akala. With feather dance, the effect of a burn could be recreated. Two feather dances later, Lurantis was five stages down. Even though Akala was taken out the next turn, she was able to make a big difference. Goshawk didn’t last long either. The ally Trumbeak was able to use rock blast and take my fire bird out. With Fuwaride, I went with a different approach. Take out Trumbeak with charge beam and then focus on the Totem. My strategy payed off. Fuwaride’s special Attack went up two stages, and I was able to defeat my team’s main counter. What didn’t pay off was Castform. That little blob set up sunny day and let Lurantis use solar blade in one turn. 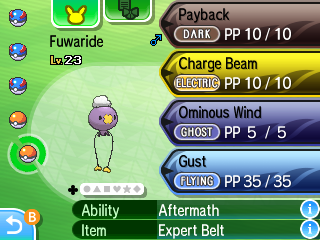 One solar blade and headbutt later, Fuwaride was gone. All that was left was Toco. If he fainted, I would lose the trial. I tried to be as careful as possible. Pluck, super potion, repeat. I did this until Lurantis fainted. 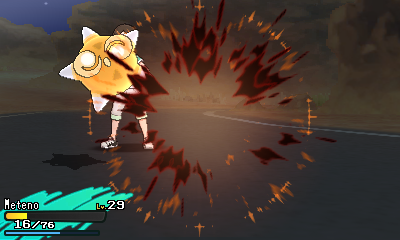 During that period, Castform continued to set up the sun and do tons of damage. Once he was singled out, I finished it off with pluck. And that wraps up another update! Next time we’ll be exploring Diglett’s Cave and praying I don’t get whooped by Olivia. Should be fun. Having another Diglett themed cave seems like an easy way to give Kanto fanservice. 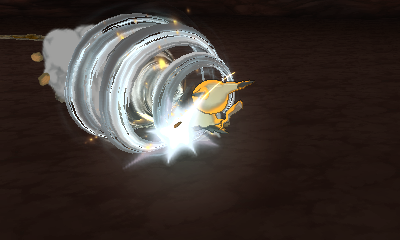 Regardless, Diglett’s Tunnel is a fairly fun cave to explore. Especially with it’s modest encounter rate. I find it interesting how Alola has two cities that use traditional Japanese architecture. Did they do this to show modern Hawaii’s large Asian influence? Got some new a new backpack, shorts, and some shoes. Now my outfit matches! I don’t think that’s how it works. I love how abundant ghost types are in this region. It makes one of the coolest types easier to find. This one “Gentleman” in Memorial Cemetery was an absolute nightmare. He packed an Umbreon with confuse ray, quick attack, and a full restore. Not a hard fight, but a tedious one. While grinding in preparation for Olivia, Akala learnt teeter dance; a reliable confusion inducting move. I gave in. Despite opposing Z-moves, I gave All Out Pummeling to Toco so he could help defeat Olivia. 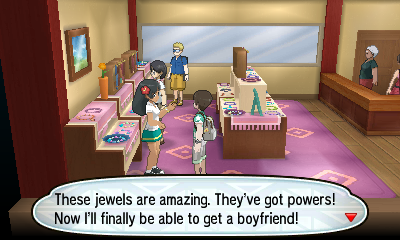 Plumeria is such a memorable admin. Her distinct design and tense battle theme really make her stand out. 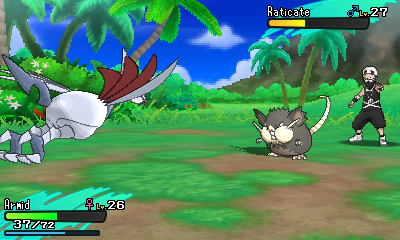 Alright, time for the Kahuna battle! I sent out Akala first to lower Nosepass’ attack before switching to Rodan. From there, she used scald to weaken the walking nose. I expected Lycanroc to use a Z-move right away, so I swapped to Goshawk. My guess was correct, he did use a Z-move. Ready for a comeback, I sent out Toco and let him use a Z-move of his own. Sadly one rock throw was all Toco needed to be taken out. Once again, I had Akala lower Lycanroc’s attack before switching to Rodan. Two scalds and the wolf dog was gone. Afraid that Boldore would take out Akala, I went to Fuwaride and healed up the team. I repeated my attack lowering strategy one more time and won. Out of all the battles I’ve documented on Azurilland, this one was the most satisfying. Despite the clear type disadvantage, I thought up a good strategy and defeated the Kahuna with flying colors. Hopefully my luck will carry over to Sophocles’ trial. The Aether Foundation theme creeps me out a bit. It’s both relaxing and calm, yet tense. Pretty fitting for the organization that resides here. Not sure how to answer this one being sixteen and all. Got to talk to “definitely not the main villain.” Nothing seemed suspicious about her. Not at all. 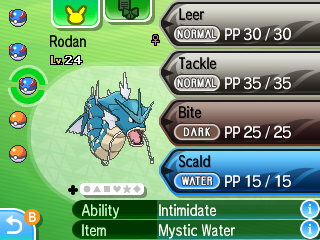 I ended up having Rodan scald Niheligo to get the fight out of the way. 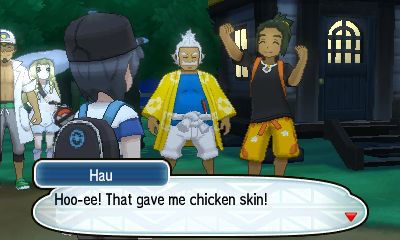 Hau was tricky to say the least. This time he was packing a fully evolved Alolan Raichu. Trying to work around it, I switched to Fuwaride and tried to use a super effective ominous wind. Sadly, Raichu swept my entire team without a hitch. Good thing you don’t have to win this fight. Maile City is my favorite town in the game; no questions asked. The unique architecture, traditional music, and beautiful music are just too good. After many great fights, it is time for Rodan to be put into the PC. The fifth and sixth members of the team are about to be caught, and Rodan has no room for it. Thanks for the help buddy. Said fifth member is a Skarmory! Her name, Armid, is Skarmory’s Japanese name. She’ll be the team’s main defensive lead. Armid was only a level behind the rest of the team, so there was no problem training her up. Aside from her awful move pool. 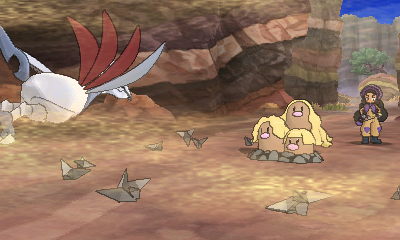 Fury attack and air cutter are not great moves for a Skarmory. Had a blast fighting these two Team Skull Grunts. They’re so easy yet so entertaining. 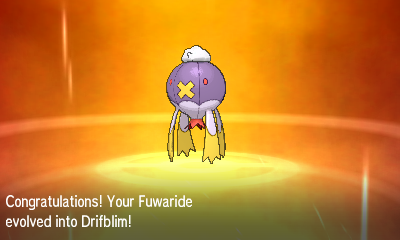 When hunting for the sixth member, Fuwaride evolved into a beautiful Drifblim! Can’t wait to see him learn some new moves. Trying to find a Minior was a nightmare. Every time I chucked a ball at one, it would self destruct. After twenty minutes of searching I caught an Orange core (my favorite color). Struggling to think of a good name, I went with Meteo. 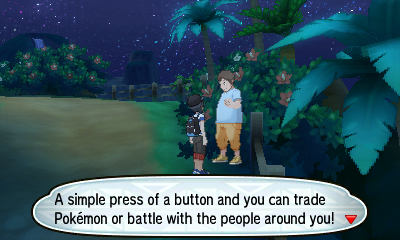 I’ll be grinding off screen in various optional areas to prepare for Totem Vikavolt. Once I’m ready to fight, I’ll upload the next part. Once again, here’s the team! I did some grinding off-screen and now everyone is at level 29. 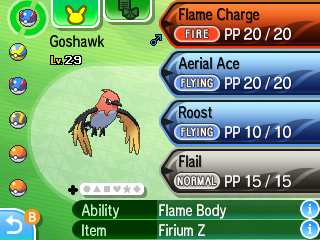 Toco evolved into a Toucannon, and Goshawk is now carrying a fireium Z in preparation for the totem battle. I also traded Meteno over to my copy of Ultra Moon briefly to get some TM moves I couldn’t access until really late into the game. Earthquake and dazzling gleam to be specific. Before starting the trial, I had to face Molayne. 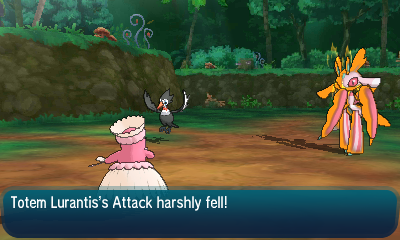 To get the fight done quickly, I had Goshawk use Inferno Overdrive on his Skarmory. 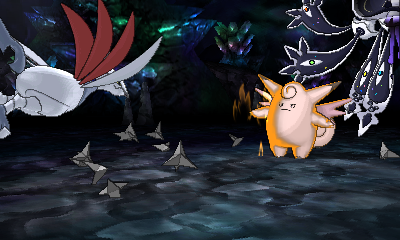 As you would expect, Skarmory walled it with his massive defense stat. 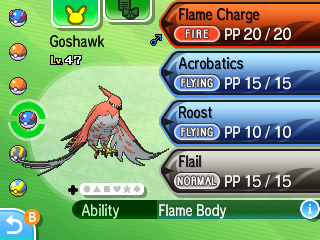 Despite how long it would take, I let Goshawk continue using flame charge. I didn’t want to continue spamming flame charge, so I swapped to Meteno and set up some rocks. This would give Meteno something to do before shields down activated and get some damage on his Dugtrio. After setting up rocks, I finished Metang off with a super effective earthquake. Unfortunately, Dugtrio outsmarted me and took out Meteno with sucker punch. The quiz was almost too easy. Not as easy as Kiwae’s trial, but it’s up there. While fighting the Charjabugs, Goshawk was taken out. So much for the Z-move. With Goshawk gone, I sent Meteno to do a super effective Ancient Power. To prevent being hit with a charge boosted spark, I swapped to Akala. She was gone in one hit. 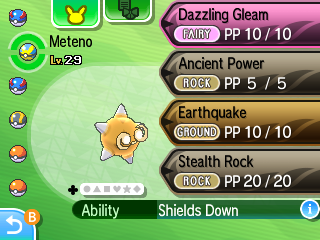 During my second ancient power, Meteno had all of his stats boosted. Too bad he was taken out during his third ancient power. To finish Vikavolt off, I had Toco try a STAB beak blast. With great success, I swapped to Armid to safely handle the ally Charjabug. 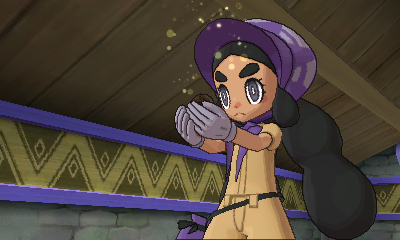 After finishing the trial, I left and fought my boy Guzma. 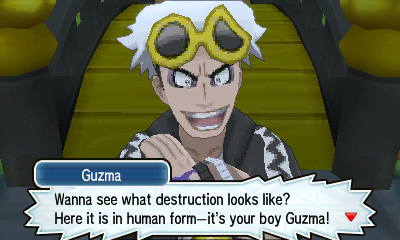 Guzma is the perfect team villain. Tough, intimidating, memorable, and distinct. His battle and out of battle themes are great too. Now that I gushed about my boy, let’s get into the battle. 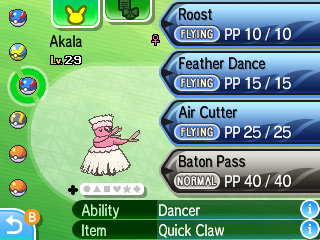 I started by having Akala use feather dance. That way, Golispod could use swords dance and not get any buffs. 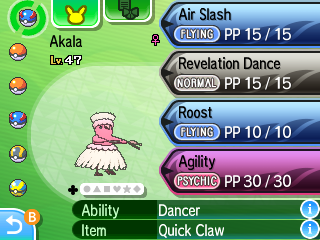 Plus it would let Akala use her signature dancer ability. Once Akala mimicked Golisipod’s swords dance, I baton passed it to Toco. Sadly he was taken out before I could give beak blast a try. At least he got burned. Ariados came in and immediately landed on the spikes. A few powerful aerial aces and he was toast. 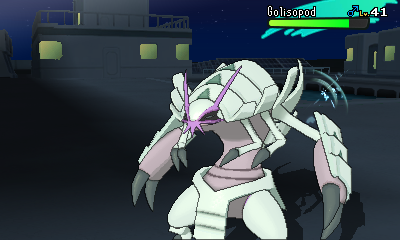 Without those swords dance boosts, Golisipod could barely do anything. He still had his burn and very little health to work off of. 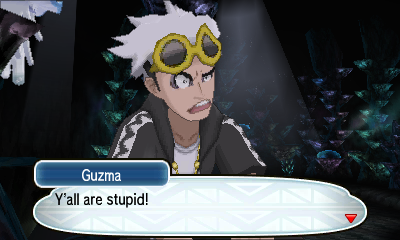 As soon as I beat my boy, Kukui gave me the Deciduem Z; a Z Crystal I can not use for the rest of the play through. And that’s a wrap. To spice things up, I’ll be documenting another game on the side. Hopefully, it goes well! On Route 13, Hapu stopped me and registered Mudsdale as a ride buddy. Her comment regarding why she didn’t give it to me earlier raises some questions about her thoughts on Lillie. Do I see a ship here? 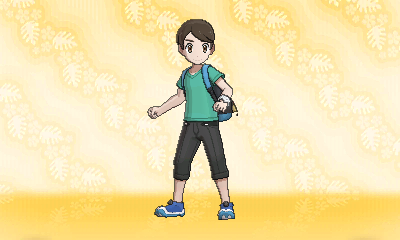 After two years of playing this game, I finally noticed that trainers have an after image in their pre-battle poses. 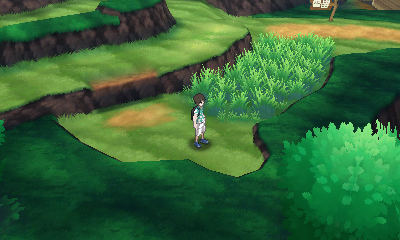 Pretty nice detail on Gamefreak’s part. I decided to stop and look for some items on Secluded Beach, home of Bruxish. While Bruxish is quite ugly, I actually kind of like it. Something about it’s color scheme just clicks with me. The way Sandygast “dissolves” after it’s KO’d is really cool. I wish more Pokémon KO animations were as interesting. 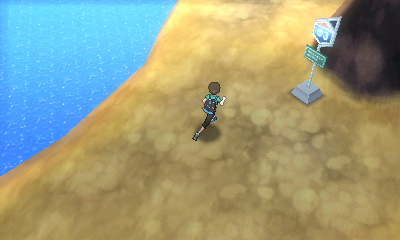 I’ve heard of black sand beaches like the one that appears in Route 14. Makes me wonder if Gamefreak got inspiration from them. To make Totem Mimikyu more manageable, I gave Armid the Tm for steel wing along with a steelium Z. With my team prepared in advanced, it is now time to start Acerola’s trial. That glitchy music that plays during the trial will never get old. It takes full advantage of the 3DS’ stereo sound. The part where you see Mimikyu sneak up on you legitimately scared me the first time I saw it. I started the totem fight by letting Mimikyu take out Fuwaride. By doing so, I could use Fuwaride’s aftermath. Then I sent out Goshawk and had him take care of the decoy with flame charge. Sadly, Goshawk was too frail and got taken out. Next was Toco. This time the decoy went down and Haunter got burned thanks to beak blast. Just before getting taken out, Toco burned Mimikyu as well. With both the totem and ally burned, I swapped to Armid and used corkshrew crash. It reduced Mimikyu with just a little HP and it fainted from burn damage the next turn. Haunter was as simple as two aerial aces. 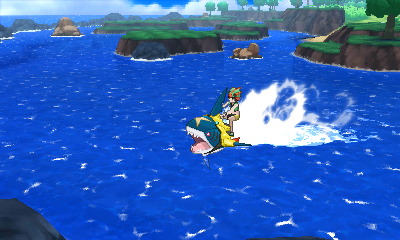 Sharpedo ride is so much fun! The exhilaration makes traversing water a breeze. If only there were more places to use it. I love Po Town. It stands out from the other towns in the game thanks to it constantly raining and housing Team Skull. It’s time for a fight with my boy! I swapped to Armid before the fight to set up spikes and to soak up first impression. 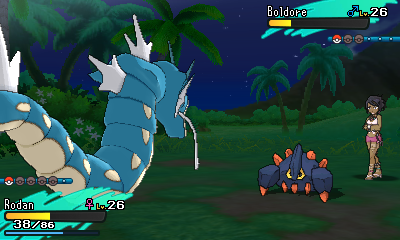 Unexpectedly, Golisipod used razor shell and took out Armid just after he set up spikes. At least he did his job. Next, I sent out Fuwaride. She used charge beam to whittle Golisipod down while he set up with swords dance. Just as he was finishing Fuwaride, aftermath came in and initiated his emergency exit. From there, I had Goshawk finish off Ariados quickly with aerial ace. As Golisipod returned, he received spike damage and couldn’t do a thing about Akala’s air cutter. Not the easiest fight in this run, but not the hardest either. Still tons of fun though. After a bit of surprisingly well written story bits, we return to our journey. I trained up the team a bit by Po Town to make Nanu a bit easier. On that note, here’s the battle. 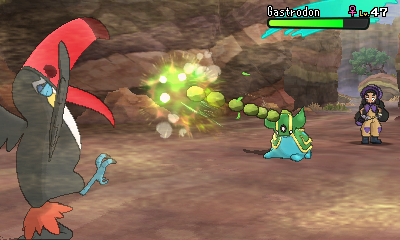 I set up stealth rocks with Meteno before using a super effective dazzling gleam. While I was able to reduce his health by 50%, power gem was just too powerful a move to last a third turn. 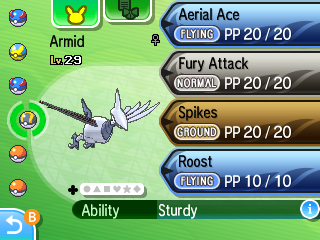 From there, Skarmory set up spikes and used aerial Ace. Even though she went down, her spikes helped wonders. With Toco’s beak blast, the pesky Sabeleye was no more. Sadly, Persian was too much for Toco to handle. Same with the rest of the team. It seems I need to train some more if I want to beat Nanu. I’ll make sure to win during this next part. After a week of grinding, it’s finally time for the rematch. Everyone’s at level 40 and fully evolved. I gave Toco a Fightium Z after taking the screenshots, so keep that in mind. 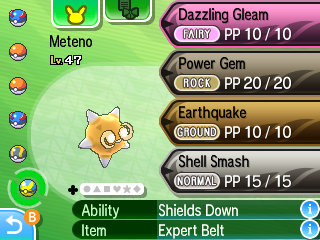 Once again, I started with Meteno and let it use dazzling gleam. 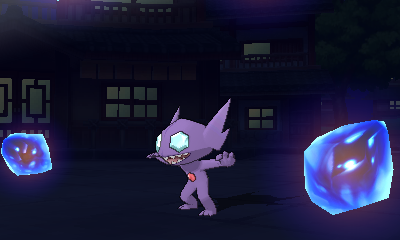 With it’s high defenses, Sabeleye’s power gem could barely do a thing. For Persian, I swapped to Armid to ensure Menteno’s safety. Saving the floating meteor until later seemed like the best idea. Sadly, Menteno couldn’t last after I let Armid soak up the hit. Thankfully, Toco was able to use his Z move before he got taken out. Last but not least, Krokorok. For this crocodile, I let Goshawk aerial ace him until flame body was activated. 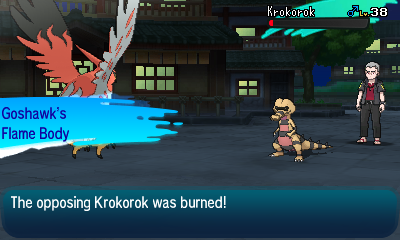 From there, the burn damage would finish Krokorok off. My strategy worked. Krokorok went out without a hitch. After a quick trip in the angst mobile, I arrived in Aether Paradise. This heist theme is pretty cool. The rock guitar in the background gives the theme intensity. If Team Skull and Team Plasma didn’t exist, the Aether Foundation would easily have my favorite battle theme among the evil teams. It’s elegant yet intense. The battles weren’t too bad. Nothing too difficult or too easy. Just right. Thanks to Wicke, my team was healed. Time for the third and final fight with Guzma! This time with his entire team. Right away, I had Akala use air slash to let Golisipod use emergancy exit. From there, Goshawk used his aerial ace to weaken and take out Ariados. Despite being weakened, Golisipod was still able to 1 hit KO Goshawk. 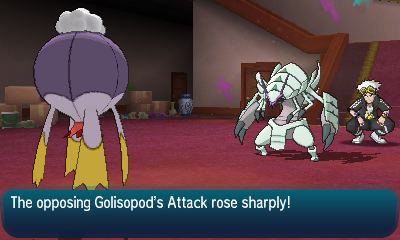 To absorb Golisipod’s attacks, Armid was sent out. With one aerial ace, Golisipod was finished. Pinsir was no issue and Masquerain was taken out with a single power gem. Not as hard as the second fight, but it was still fun. I’ll skip the story bits, but I will say I love this game’s plot. It’s so engaging and well written. Every character is distinct and they play off each other wonderfully. I pray Gen 8 will have a story just as good, if not better than this one. I was able to think of a voice for Luisamine. If there is ever an Azurilland theater event for Sun and Moon, you know who’s auditioning for the head honcho. We start the fight with Luisamine by setting up spikes with Armid. This will do a small amount of damage to every Pokémon she sends out. 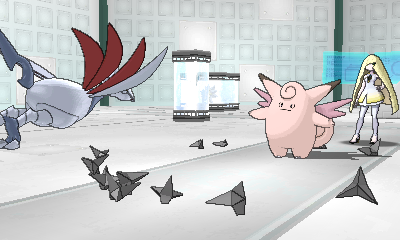 Then I used steel wing to weaken the Clefable. Mismagius was a different story. Her shadow ball and mystical fire took out Fuwaride and Akala instantly. Without Toco’s beak blast, I would’ve been toast. Milotic was also did a number on poor Toco before he fainted. With Lilligant, I had one goal. Take her out as quickly as possible. Thanks to Goshawk, that dream became a reality. Two aerial aces, and she was gone. Last was Bewear. This was intense as my only remaining Pokémon was Menteno. To be safe, I used cosmic power to prevent an easy KO. Sadly her Bewear was able to whittle Menteno down to it’s core and finished it with a take down. Once again, thank Arceus that you don’t have to win this battle. And that’s a wrap. Sorry for not updating recently. Midterms and a trip to the coast can really fill up your schedule. I’ll make sure to update more regularly again. Ah, Poni Island. It’s my favorite of the four islands simply for the explorative nature. I hope the next game in the series incorporates this element as well. 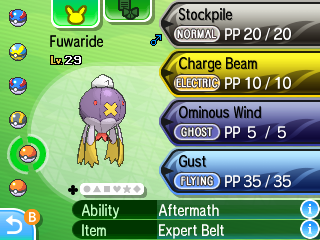 After getting Machamp Shove, I went back and picked up the Flyium Z. My attitude towards Z moves has improved, and I think it’s okay to use them. You spend the entire game learning about these Kahunas and at the end you get to see a character you’re familiar with become one. It’s a magical moment to be sure. Out of all the locations in the game, Exeggutor Island is my least favorite. It’s small, empty, and relatively uninteresting. I wish there was more to do here outside of the story. 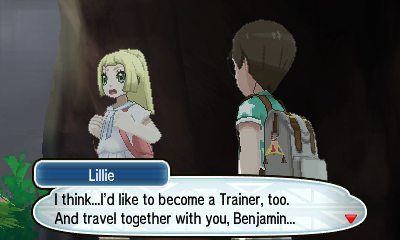 Lillie flirting with the player is adorable, but it doesn’t go anywhere. One of the many plot points the series left unresolved. If only she was real. After some excellent character development with Team Skull, we begin the final Kahuna battle. Once again, I set up some spikes before going all out. Then I swapped to Meteno while Hapu changed to Flygon. 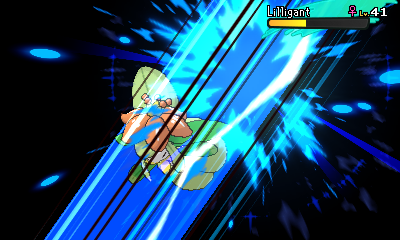 To ensure Meteno’s longevity, I used cosmic power while Flygon activated shields down. Sadly, Flygon went right through Meteno and forced me to switch out. Armid soaked some hits while I was healing Meteno up. Just as I was starting to weaken her Flygon, she swapped to Dugtrio and took out Meteno. Out of retaliation, I swept Dugtrio and Gastrodon with Toco. With brick break and bullet seed, that isn’t too difficult. 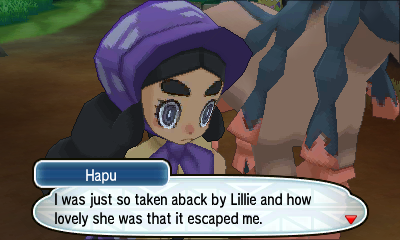 As expected of Hapu, she swapped to Mudsdale while I was weakening Flygon. Spike damage, shadow ball, and after math were more than enough to lower Mudsdale to red health. All that I needed to do to finish him was a single beak blast. 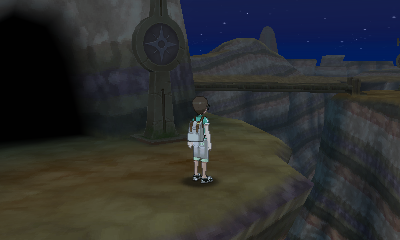 I wish the caves in this game were more like Ancient Poni Path. It’s so much fun to explore and find TMs. The training got my team up a few levels, but they need some more time. 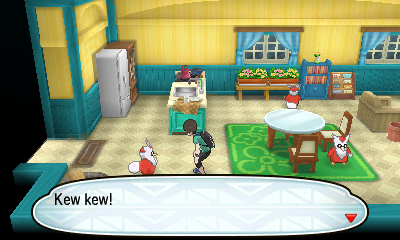 I’ll let them hang out in Pokepelago for a few days before I go to Ultra Space. After training up, my team reached level 47. Perfect for the challenges up ahead. Since Meteno is the only Pokémon on the team to have a fairy type move, I let him go first. I love the intensity of this trial. The ominous sounds, staring messages, and ally Pokémon are so nerve racking. To get Meteno’s stats up, I used shell smash. 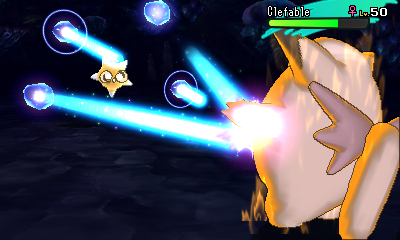 The following dazzling gleam reduced 66% of Kommo-o’s health and took out the ally Pokémon. I then had Toco finish the totem with a well timed beak blast. Not as easy as Totem Raticate but not as hard as Totem Vikavolt. Watching Nebby evolve into Lunala shows just how far this series has come technically. The music that plays in Ultra Space is so alien. I can imagine this playing on another planet. “It was like I became someone else, and I finnaly felt what fear feels like.” Hearing Guzma describe how a Niheligo possessed him is one of the creepiest moments in the franchise for me. Luisamine is such despicable villain. Every nasty thing she says to her daughter and the player is horrible. It makes you want to defeat her team and prove her wrong. 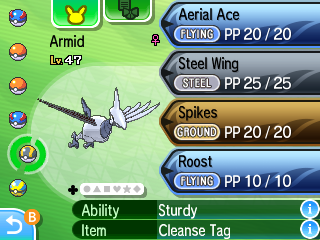 For the third time, I put up a few spikes with Armid and used steel wing. The damage the other Pokémon receive from the spikes would make them easier to take down. What came next was a stall battle of the utmost degree. Every cosmic power and moon blast made steel winging it more difficult. Eventually it did run out of moon lights and I was able to beat it with a crit. Mismagius has this weird habit of using pain split when I was purposefully trying to weaken it. It made taking the floating ghost out a breeze. Milotic was another pain. Air slash, revelation dance, recover. That is my interaction with Milotic. It was so tedious, I won’t describe it more. Exploiting Bewear and Lilligant’s weakness to flying made them complete pushovers. Overall this fight was all over the place. Sometimes it was infuriating and other times it was pitifully easy. A decent fight, but a mixed one. Even though I had a master ball on hand, I still let Lunala’s beautiful battle theme play. It has such a strong 80’s vibe. Before I take on Gladion one last time, I’ll grind my team up. His team is five levels higher than mine and they are strong.